Oh, what a pleasant surprise. I have to be honest, I kind of just picked this up on a whim. I’ve always had a passing interest in Cloak and Dagger—while I’ve never actively sought them out, I always appreciated them when they made appearances in various titles I’d be reading. Hearing about this miniseries, I was a little turned off at first by the idea that it’s a tie-in to the “Spider Island” event. Oh, another event? Another tie-in? I was ready to pass on this. I was gonna pass on it so hard, its face was gonna hurt. Well, something obviously changed my tune. I’m not sure if it was the preview art, the fact that there was a female creator on the book, or just the overall badassery of Cloak and Dagger that convinced me to give it a try, but I’m glad I did. This was enjoyable. While this story does function as a tie-in to Spider Island, I’d argue that it’s a pretty loose one. I’m not reading Spider Island at all, but I could get into the setting for the story quite easily from the recap page, and then it’s all more or less relegated to the background from there. This is not so much about Cloak and Dagger reacting to Spider Island as it is just about Cloak and Dagger themselves, their relationship, and what makes them tick in the midst of all the action. These are the types of stories I always want to read, and Nick Spencer, despite being quite a busy man these days, appears to deliver. Here, we learn that the duo is being evicted from their makeshift home inside a church. Cloak takes matters into his own hands and arranges a “Heroes for Hire” type of setup for the pair, of which Dagger is critical. What makes the events and discussions in this issue so interesting, though, is how it’s all laid out for us by Emma Rios. The artwork most certainly amplifies the dialogue coming out of the characters’ mouths, particularly during one double-page spread that’s done just achingly well. Rios plays with Cloak and Dagger’s dark and light, yin and yang, form and function aspects of their personalities, and it accompanies the script in a way that’s complementary, not overbearing. If I have any reservations regarding the script, I’m worried Nick Spencer will just beat us over the head with this yin yang analogy for the rest of the mini, but I’m hoping that isn’t the case. I feel like he’s a talented enough guy not to go that route, and I think the remaining issues should be equally good if not better. Oh, one weird thing—there’s a part where the Avengers show up, and Wolverine has some pretty skeevy dialogue when talking to Dagger. I don’t really get it. It seemed noticeably off to me. Meh—if that’s the worst thing, I’ll take it. I’m actually kind of anxious to learn what happens, especially when you consider who the villain of this is—which I’ll let you find out for yourselves. If you’ve got some room in your pull list to play around, check out Cloak and Dagger. Well … that was fun while it lasted. I guess this isn’t a review of this issue alone so much as of the series overall, as Bryan Q. Miller wraps up two years writing what has been a truly wonderful book. I’ve voiced my devout love of this series before on this blog, so it’s probably unsurprising that I was nearly in tears reading the final issue of something I have cherished for the last 24 months. That’s how good this title has been, that I can get this emotional over its ending. 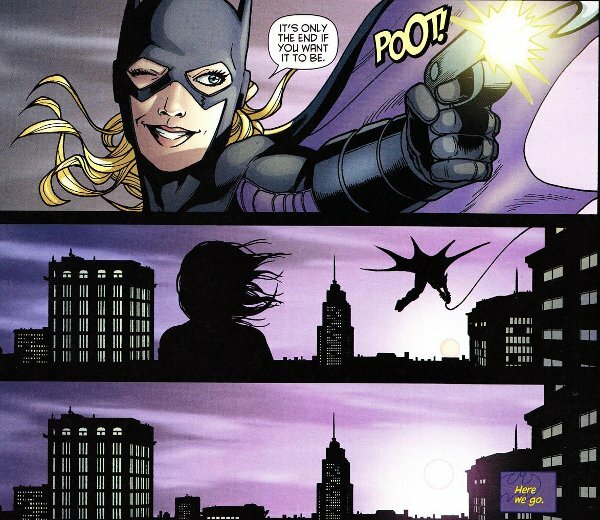 Although I’m looking forward to reading the “New 52” Barbara GordonBatgirl under Gail Simone, I can’t help but feel major heartbreak over losing a character I never expected to love this much—Stephanie Brown. Bryan Q. Miller does a great job in concluding the series with this issue. Readers from the last issue will recall the unexpected appearance of Stephanie Brown’s father, Cluemaster—the catalyst that set Stephanie off parading as a vigilante in the first place during her Spoiler days. This is Steph’s first meeting with her dad since she was “killed,” and it’s a dramatic one. I only wish Miller had more time and more issues to write and develop this encounter (his plans were cut short via the reboot mandate; read the interview here). As it is, he uses this opportunity to bring Steph on a “what if” style adventure—what could have been for her, what she dreams of her legacy as part of the Bat family, what could await her in the future, etc. I’ll leave it to you to discover the plot device Miller uses to bring all this about; it’s something I haven’t seen in a while, so there’s a bit of nostalgia there, and I really enjoyed it. The artwork by Pere Perez does a lovely job of conveying the ideas present, and Dustin Nguyen’s cover is beautiful and perfect—as his stuff always is. Man … this is depressing. I’m going to miss this book so hard. If you’ve never read this title, you’ve really missed out on something special. Fans who once clamored for Cassandra Cain are now clamoring for Cass AND Steph, and hey—how awesome would a TEAM BATGIRL book be?! We struck gold with this incarnation of Batgirl, and all I can do is wait patiently for Steph’s triumphant return. Her happy-go-lucky, never-say-die attitude means she’s bound to come back eventually. Right? This entry was posted on 08/26/2011 by ravenhaired. 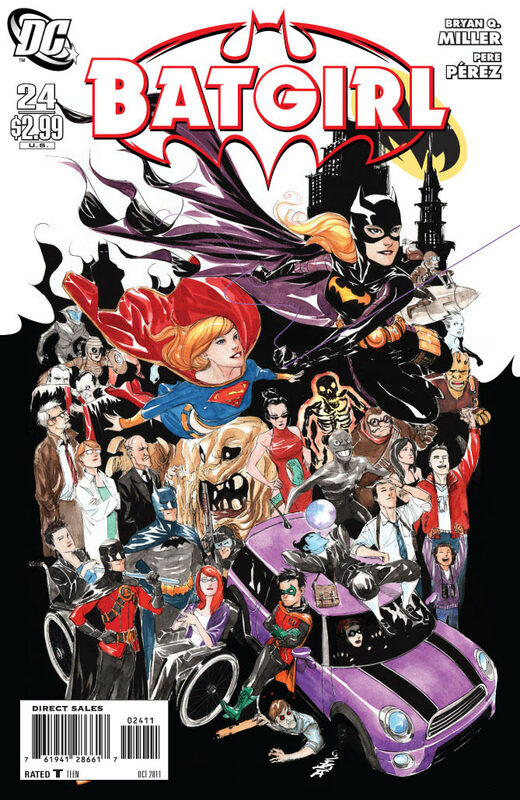 It was filed under Comic books, Female Characters / Creators, Reviews and was tagged with Batgirl, Bryan Q. Miller, Cloak and Dagger, DC, Dustin Nguyen, Emma Rios, Marvel, Nick Spencer, Pere Perez, Stephanie Brown.